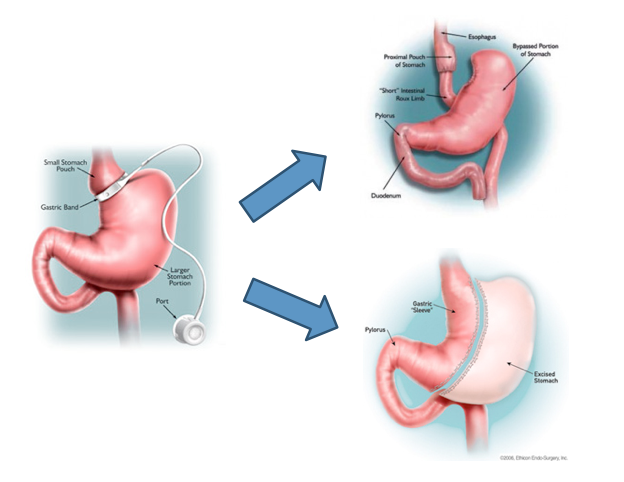 We no longer offer the gastric band at Riverside Surgical, but if you have had a band placed and are experiencing problems we offer conversion of gastric band to sleeve gastrectomy or bypass. Sometimes after people undergo LAGB surgery experience problems. These problems may include significant heartburn that does not seem to get better even with medication. They may also experience vomiting or difficulty eating depsite being properly adjusted. This does not happen frequently, but when it does occur, it can be very frustrating. Alternatively, the esophagus (the tube above the stomach) may become dilated from the band being too tight for long periods of time. This is not a safe situation long term as it may lead to esophageal dysfunction or erosion of the band into the stomach. Other potential but infrequent problems with the lap band include slippage or prolapse. That is the band changing position within the abdominal cavity. This may result in the band not functioning correctly and needing to come out. For those not wanting a replacement band, the laparoscopic sleeve gastrectomy may be an alternative option. Dr. Domkowski and Dr. Radecke performs conversion of laparoscopic bands to laparoscopic sleeve gastrectomies and bypass. Even if people have experienced significant weight loss with the laparoscopic adjustable gastric band, if it needs to be removed for whatever reason, then weight regain is highly likely. In order to keep this weight off long term, another bariatric surgery will need to be performed. Both the laparoscopic sleeve gastrectomy and gastric bypass after lap band removal is a very good surgical option for many band patients who did not reach their weight loss goals. Early published data demonstrates excellent weight loss in those patients undergoing the laparoscopic sleeve gastrectomy and gastric bypass after removal of the gastric band. If you are not happy with you laparoscopic adjustable gastric band, even if you had it placed in another state, please schedule an appointment today with our center and be evaluated for the laparoscopic sleeve gastrectomy or Laparoscopic gastric bypass.